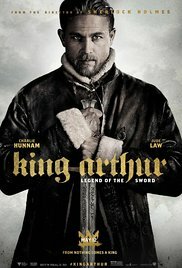 This adaptation of the classic King Arthur story gives us a glimpse of how powerful the Sword Excalibur is and tells the story of a boy growing into a man. Eventually, the man must wield the power of the sword for the sake of saving his land and his people. In this cast, we get some new faces but also some familiar ones from past movies and television including: Charlie Hunnam, Astrid Bergès-Frisbey, Jude Law, Djimon Hounsou, Eric Bana, Aidan Gillen, Freddie Fox, Craig McGinlay, Tom Wu, Kingsley Ben-Adir, Neil Maskell, and Annabelle Wallis. The film tells the story of an evil person who overthrows a good king. After many years, he must face and kill whoever can manage to pull the sword from stone or else his plan to rule over all the land will end. We see Arthur 's childhood and the circumstances he was raised in. We learn Arthur's reasons for doing good and how much he cares about his loved ones and wants to help them. Charlie Hunnam is known for his role on Sons of Anarchy and his work in other shows/movies, but I enjoyed him most in the film Pacific Rim. Having said that, I noticed that his acting skills have improved since Pacific Rim, and he had a good cast around him which made this film fun to watch. There was plenty of action, some comedy, and the story was decent. The only problem that I had was that I thought the flick was a tad too long, but that didn't stop me from leaving with a smile on my face. If you like old knights, magic, and Vikings then this film is just right for you.